To learn more about volunteer and/or membership opportunities at Colonial Playhouse, contact us! Get Involved in Your Community Theater! Looking for something to do? Interested in learning more about what goes on behind the scenes at Colonial? Why not get involved? We are a non-profit organization and everyone, from actors to ushers, donates their time for the love of the art of theater craft. We have a great time! You can, too. 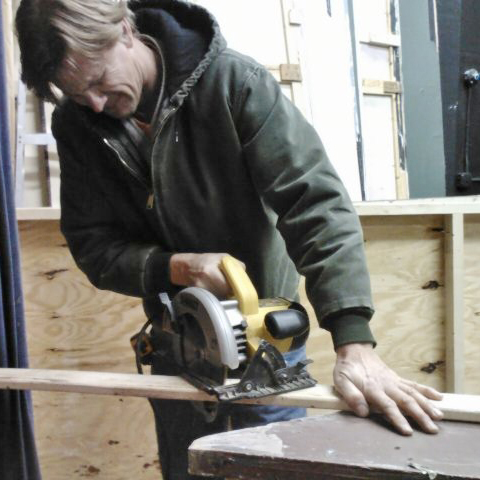 We can always use more hands on all aspects of our theater productions. You can give acting a try by coming out to one of our auditions – no experience necessary! Or you can support a show by helping out with costumes, props, set construction and painting, and more! Colonial members take their volunteering to the next level. Annual dues are $30 – that’s less than half the price of a season ticket – and as a member you can come to any performance of any show for free! You help the theater by contributing your time and talents to service on committees, such as hospitality, fundraising, set construction, and other special projects. Colonial members attend general membership meetings, vote on agenda issues, and are eligible after 1 year to run for office. Members are also invited to social events throughout the year. We are a great community of fun and creative people; if you have been volunteering with us and want to become a member, talk to a board member and we'll be happy to sign you up and welcome you to the Colonial team!